The public consciousness and awareness of gluten and its dangers has been growing over the years. A multitude of symptoms can occur and are listed below. 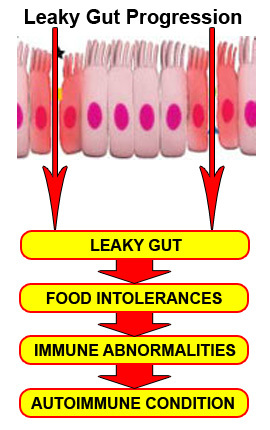 Leaky gut Syndrome can develop slowly over time (even without gluten sensitivities) – from the long term exposure to inflammation within your digestive tract. Gut-Brain connection–Fantastic 3 min video (with informative animation) on testing for Gluten sensitivities and other allergies to gut.. A new standard of excellence in testing for gluten sensitivity via affordable salivary panels (they also have blood tests) covering not one but ALL fractions of gliadin–with an unprecedented 92-96% accuracy rate. As the intestine inflammation continues over time, it first wears away the mucosal lining of your intestines which accounts for 80% of your immune system. “When larger undigested protein molecules enter the bloodstream, your body goes to work. So the immune system starts to set up a response to these large, undigested protein molecules that enter the bloodstream. That would be okay, but for the fact that some of these protein molecules resemble the same protein molecules that reside on the outside of cell membranes in certain parts of the body… In some of your joints, there are cell membranes that have proteins that may resemble some of the proteins that your body just set up an immune response to… your immune system does not know which is the enemy and which is friendly, which is you. So it fights them all. As a result of your having introduced these foreign proteins into the bloodstream that happen to resembles ones that you have that are actually friendly, your immune system starts to attack you. “When the intestinal lining is damaged even more, substances larger than particle size — disease-causing bacteria, potentially toxic molecules, and undigested food particles — are allowed to pass directly through the weakened cell membranes. They go directly into the bloodstream, activating antibodies and alarm substances called cytokines. The cytokines alert our lymphocytes (white blood cells) to battle the particles. Oxidants are produced in the battle, causing irritation and inflammation far from the digestive system. According to Dr. James Braly and Ron Hoggan, authors of “Dangerous Grains: Why Gluten Cereal Grains May Be Hazardous to Your Health,” they also agree with the statements above and offer a partial list of conditions below. Conditions listed show an association to gluten consumption. Consider eliminating grains- specifically gluten-containing forms from your diet. What type of Doctor deals with disorders like this? Functional Medicine or Functional Nutrition.